Shall not be infringed. I agree with all that you have written. That being said, the unconstitutional laws that exist are the ones being followed/enforced in order to arrest individuals such as this Militia member. Revisionism on all ends has done a great deal of harm to our nation and citizenry. Unfortunately, those laws are on the books for now and the Supreme Court doesn't seem to care enough to do anything about them. The Communists are doing their best to legislate our rights and freedoms away. They're suing every conservative voice and organization into financial oblivion and cutting off the means for financial support of those voices and orgs. They have the schools, they have the media, they have the borders, they have financial power, and they have their own private militia forces via groups like BAMN, BLM, Antifa, RR, and the list goes on. People like to talk about Conservatives as being the rich and wealthy CEO's and heads of the rich corporations. Anyone with half a brain could research who the largest and most wealthy corps are in this nation and discover who those corporations fund politically and socially. They're overwhelmingly leftist and progressive. Silicon Valley is just one example. Being a patriot will eventually be illegal in this nation if the communist leftists get their way. Time is ticking. The question is... when will the camel's back break? If there is any consolation on the matter... nobody has been arrested for the actions taken at the border by the Militia group. His arrest was solely for being in possession of a firearm when he was not supposed to be due to a past felony charge/conviction. As has been said, we do need to keep an eye on this situation. The ACLU and other elements of the Communist machine most certainly have their eye on it as well. 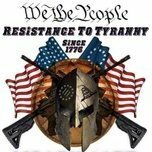 The United Constitutional Patriots Militia is looking for additional support and has had their funding cut off by PayPal. As per the rules of Socialism... everyone won. We are all entitled to an equal percentage of the knife. That is, of course, after the forum owners themselves take 90% of the knife for the purposes of running the forum. All members will equally share in the remaining 10% of the knife. I run hot and cold with Glenn. But, the info he presents is a reminder to us of what is actually at work in our country. I love the reaction. But, if we don't make 'large' capacity magazines illegal... people might buy them! Duh. People tend to buy products that are legal to purchase and possess. Turns out that people still buy things even when they are illegal (war on drugs... cough). I suppose they never considered the fact that folks from California could go on vacation out of state and pick up a few standard magazines and bring them back home. Our technocrat overlords don't want us knowing too much. Do you have secret decoder rings as well? Be sure to drink your ovaltine. Jesting aside, glad to know there are some groups training and preparing in the region. Rindge is a very nice community. Fresh water and natural resources. A small university that could easily be converted for more useful purposes in the event of civil war, wrol, shtf, teotwawki. They also have a Taco Bell / KFC... which is where I'll be when the SHTF to get my final gordita supreme. https://katana17.wordpress.com/2019/03/15/the-great-replacement-manifesto-of-new-zealand-mosque-shooter-mar-2019/ Read before it gets scrubbed - if you wish to do so. Everyone should read his manifesto. He clearly states that his intention was to push us closer to civil war by stripping Americans of their 2nd Amendment rights through leftist legislation following this tragic event. But... but... but... but... the MSM told me he was a far right President Trump loving conservative!!! Oh, and he's white!